Red Hall Farm in Shipton is approached by a long private road from the Winslow to Swanbourne Road. It was built either by Richard Lowndes or his son Wiliam Lowndes soon after the inclosure of Shipton under a private Act of Parliament of 1745. The new farmhouse was positioned in the centre of their allotment for the convenience of routine farming operations. Shipton Cowpasture containing 93a 3r 18p adjoining to the Red Field of Shipton on the south, to Swanbourne Common Field south east, to Little Horwood Common Field north and to Licehill Field west .... and all the rest residue and remainder of the Common Fields not hereinbefore awarded to others containing 309a 1 r 6p. Widow Hillyer: 4 horses, 1 waggon, 2 carts. On Monday the 3d Day of April, 1809, on the Premises of Mr. JONAS JOHNSON, at Red-Hall, in the Parish of Winslow, Bucks. PART of the LIVE and DEAD STOCK, and other EFFECTS, of the said Mr. JOHNSON, who is leaving the Farm; comprising six useful Dairy Cows, one Nag Horse (rising five Years old), 60 Ewes and Lambs, one Six-inch-wheel Cart, seven Milk-Leads, and seven Hives of Bees. - Also Part of the Household-Furniture, and other Effects. → The Sale will begin at Eleven o’Clock, under the usual Conditions. Sheep, Dairy Vessels, Household Furniture, &c.
COMPRISING upwards of 50 Couple of Southdown Ewes and Lambs, capital winnowing Machine, Scuffler, Drill, double and single Ploughs, land Roll and Frame, Sieves, Kneefan, bushel Strike and Shovel, Forks and Rakes, draining Tackle, odd Harness, working Tools, long Ladder, two short Ditto, sheep and cow Cribs, pig Troughs, hen Pens, Carpenters’ Bench and Vice, Saw, and Ash Timber, about 4,000 forge Fagots, and a Quantity of fire Wood; dairy Vessels, as 14 milk Leads, cream Cistern, butter Kivers, Scales, Weights, and Trenchers, cream Tins and Pans, four pair milk Buckets and Yokes; household Furniture, as stump Bedsteads, flock Beds, kitchen and stove Grates, and smoke Jack, four wood Chairs, dough Trough, 40-gallon Copper, 20-gallon Ditto, oven Lid and Frame, four large sweet iron-bound beer Casks, and smaller Ditto, with numerous other Articles. RED HALL FARM, WINSLOW, Bucks. (By order of the Executors.) – Particulars next week. THE entire and valuable FARMING STOCK; comprising 37 useful dairy cows, heifers, sturks, and bull; eight cart horses and mares; 34 in-lamb Leicester ewes, 17 shearhogs, 23 tegs, 17 fat ewes, and one ram; six fat pigs, six porkets, gander, and two geese; rick of beans, hovel of ditto, 130 acres of sound keeping, nine acres of turnips, 90 tons of hay, 80 fleeces of long wool, stout narrow-wheel wagon, two six inch-wheel carts, two narrow-wheel ditto, two ploughs, two pair of harrows, drag harrow, six-stone staddle, six post ditto, cart hovel, ladders, sheep and pig troughs, seven sets of horse harness, saddles and bridles, barn tackle in general, chaff-box, wheelbarrow, grindstone, forks, rakes, and working tools, 14 milk leads, double cream cistern, kivers, cream tins, nine milk buckets, four yokes, scales and weights; also, several lots of Household Furniture, quantity of pewter, brewing utensils, ale casks, coppers, and various other effects. The whole will be expressed in catalogues, and may be had at the Inns in the Neighbourhood; Place of Sale; and at the Auctioneer’s Office, Winslow. The Sale will commence each morning at Half-past Ten o’clock precisely. Order of Sale :- Implements, Cows, Heifers and Sturks, Bull, Horses, Hay, Turnips, and Keeping, on the 1st day; Dairy Vessels, Sheep, Pigs, Geese, Brewing Utensils, and Household Furniture, on the second day. Before the same Coroner [J.W. Cowley], at Winslow, on the 13th inst., on view of the body of Mr. John Brise, aged 40, a highly respectable farmer, who came by his death under the following distressing circumstances:- about 12 o’clock on the previous Monday he mounted a spirited horse, for the purpose of breaking him in; after rearing and plunging for some time, he started off, and proceeded about 50 yards, when one of the stirrup-leathers gave way, and deceased was thrown against a post, which produced a violent concussion of the brain. Surgical assistance was immediately procured, but every effort proved unavailing, as he died in a state of insensibility a few hours afterwards. – Verdict, “Accidental Death, with a deodand of 1s. on the horse.” We regret to add the unfortunate deceased has left a widow and five children to deplore their loss; he was brother to the wife of Mr. Joseph Ivatt, of Aylesbury. 20 VALUABLE YOUNG DAIRY COWS, Alderney cow, long-horned bull, 4 stout cart horses and mares, useful bay hackney, handsome brown nag horse, (by OTHO), six fat porkets, 8 store pigs. 140 ACRES of very SOUND KEEPING till the 25th of March next, 10 acres of Sweed [sic] turnips, &c. &c.
The usual credit will be given for the hay, corn, and keeping. The purchasers of the hay and corn will be accommodated with the yards, barns, and cow-houses for thrashing and spending the same. The Sale will commence at Ten o’clock. Catalogues will be prepared, and may be had at the Inns in the Neighbourhood, and at Messrs. Dudley & Son’s Office, Winslow. The farming implements, dairy vessels, &., will be sold on a future day. ALL Persons who have any Claim or Demand against the Estate and Effects of Mr. JOHN BRISE, the elder, late of Swanbourne, Bucks, Dairyman, or of his Son, Mr. JOHN BRISE, the younger, late of Red Hall, in the Parish of Winslow, Bucks, Dairyman, respectively, deceased, are requested to deliver particulars thereof, and of the securities, if any, which they hold for the same, to Mr. JOHN MORECRAFT, of Winslow, aforesaid, the surviving Executor of the said John Brise, the elder, or to us as his Solicitors, within a month from the date hereof, in order that the same may be examined, and, if correct, discharged. And all Persons who stood indebted to either of the said deceased at the time of his death, are required to pay the amount of their respective debts to Mr. Morecraft, or us, within the above period. BY DIRECTION OF THE EXECUTOR. COMPRISING two strong narrow-wheel Waggons, two stout 6-inch wheel Carts, narrow wheel cart, chaise-cart and harness, stout-built gig with lamps, three pair of harrows, three Ransome ploughs, (complete), two swing do., land roll, turnip-cutting machine, twenty doz. of hurdles, double corn bin, lead horse-trough, grindstone and stand, four sets of horse-harness, three sets of thill do., saddle and bridle, chaff-box and knife, 30-round ladder, cow cribs, sheep racks and troughs, twenty-four corn sacks, bushel, strike, and shovel, six corn sieves, drag rakes, forks and rakes, draining and working tools, handsome she-goat, fourteen large milk leads, cream cistern with brass tap, kivers, three pair of milk buckets and yokes, water cart on wheels, and other effects. The Sale will commence at 11 o’clock. Catalogues may be had at the Inns in the Neighbourhood and at the Auctioneers Office, Winslow. 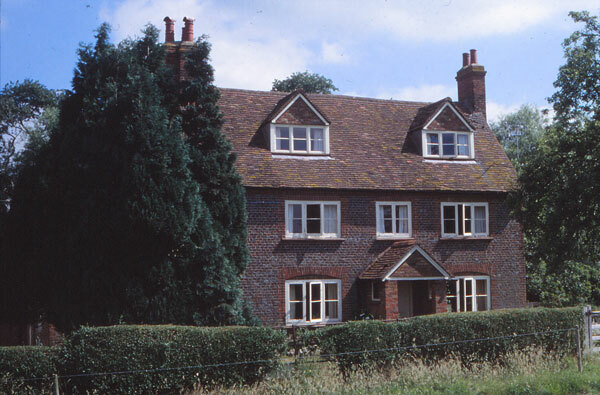 1879 Death of John Woodward, 28 Feb.
Property left to brothers Francis and Thomas. 1890 Death of Francis Woodward, 26 Feb.
1891 Directory. Dancer, Frederick William, Farmer, Red Hall Farm. 1893 Death of Thomas Woodward, 10 March. 1902: Bucks Herald, 12 April. 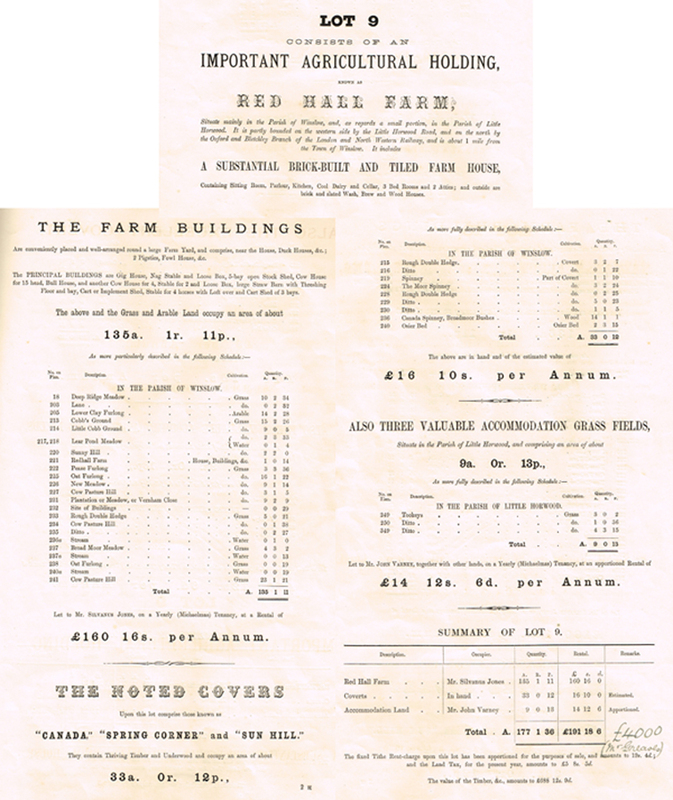 Sale of stock and furniture of Mr W C Cowell, Red Hall Farm, who is leaving the district. Beckett, Herbert Gaius, Farmer, Red Hall. Beckett, H. G, Red Hall Farm.